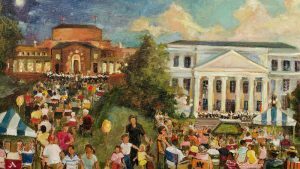 For over 40 years, the Montgomery Symphony Orchestra has played a key role in Montgomery’s artistic community. Throughout the years, many individuals have given generously of their time, talent, and resources to ensure that residents of Montgomery’s River Region and the state of Alabama have the opportunity to hear great orchestral works performed. The Montgomery Symphony Orchestra began in 1976 under the direction of First United Methodist Church Music Director John Dressler who originally organized the group to accompany the church’s choirs. Wind, brass, and percussion players were recruited and a close relationship was developed with the City of Montgomery’s Parks and Recreation Department through the efforts of Joanna Bosko, the city’s Cultural Arts Supervisor and a member of the orchestra. The MSO rehearsed at the church and as it grew, began to offer concerts in the community. Maestro Dressler guided the young orchestra with great success and retired from the podium in 1979. MSO trombonist Marshall Brown was the Orchestra’s second conductor and led the MSO for three seasons. It was during this time that the orchestra’s structure began to take shape. A Board of Directors was formed in 1980 and incorporated in 1981 under the leadership of Stanley Gregory, President. The Montgomery Symphony League formed a year later with Barbara Barnes serving as the first president. Following a year-long search for a new Music Director and Conductor, Thomas Hinds stepped onto the MSO’s podium at the beginning of the 1983-1984 season where he remains today. Many of the Symphony’s best known concerts and programs, including the Children’s Concerts, Broadway Under the Stars, the Montgomery Symphony Radio Show, and the Fellowship Program, were instituted under his direction. His debut as Music Conductor coincided with the MSO’s debut on the Davis Theatre stage. In the late 1980’s the organization turned its combined efforts toward nurturing the artistic development of the Orchestra. The Fellowship Program brought a world class violinist into the MSO’s midst to help lead and inspire the strings. A new scholarship program sponsored by the League supported the musical development of the orchestra’s volunteer musicians by subsidizing lessons and promoting attendance at music festivals. An instrument loan fund allowed players to purchase more professional caliber instruments. Finally, the MSO moved its weekly rehearsals from its longtime home at First United Methodist Church to the Davis Theatre. Helen Steineker was appointed the Manager of the Montgomery Symphony 1986, expanding the orchestra’s capability to establish and maintain programs. A focus on music education inspired the development of several programs in the 1990s. The Montgomery Symphony Radio Show first aired in 1992 and continues today, providing a weekly opportunity to educate listeners on all aspects of music. Two other programs, the Trawick Players and the StringFellows Summer Music Seminar were initiated to provide musical learning opportunities for elementary and junior high students. The key to the success of the Montgomery Symphony has always lived in the hearts of those who loved it. Through the years, hundreds of musicians have devoted nearly a half million volunteer hours to rehearse and perform the great music of the ages. Many musicians have pledged their Monday nights to the MSO for 30 years or more, including several charter members. The maturity they bring to the Orchestra’s performances under girds its artistic success. In appreciation, they have been supported by the time, energy and resources of an entire community and sustained by the enthusiastic applause of a grateful audience.